Godzilla: King of the monsters or supporting character? Director, Gareth Edwards delivers a new Godzilla film that is a masterwork of suspense and creates a world filled with tension and atmosphere. My only concern was, why wasn’t the main character in more of it? The film borrows heavily from the structure of the original Jaws and uses that formula to great effect. The suspense and world building do well to draw one in and the feeling of immersion is fantastic. The movie does suffer only slightly from a feeling of being uneven in places. With only cursory mentions of the title character and one speech explaining his existence, the film presupposes that its audience has a knowledge and love of the myth and legend going into it. Which unfortunately would leave the casual or uninitiated fan slightly underwhelmed. Since his debut in 1954 with the original Ishiro Honda film,Gojira, the king of the monsters has developed into a character and icon with a rich history and backstory. While this movie is truest to the original film in its suspense and allegory about the fate of our world if left to nuclear power and pollution, it misses the mark just slightly in terms of giving the audience the icon of Godzilla in his full glory. Instead the focus is placed on Aaron Taylor-Johnson and Elizabeth Olsen, who play a married couple separated by the disaster. While the human element is always needed in these pictures, to ground the fantasy and give the audience someone to relate to, the main plot,when not revolving around the giant monsters,was your average disaster movie fair. One might argue that showing too much of the initial creature battles would have dulled the impact of the final glorious smashup, but I would offer the counter argument that because the suspense had been built up so perfectly by the time Godzilla does show up in his own movie, a complete shift was warranted and the battles should have dominated the second half. With all that being said, I must make it very clear that the film is extremely well made. Gareth Edwards is a brilliant director and every single member of the cast treats the material with reverence and give outstanding performances. The heart racing score by Alexandre Desplat took my breath away and the cinematography by Seamus McGarvey was outstanding. The digtial imagery was seamless and engrossing and brought the giant monsters to life in amazing fashion. The final battle was tremendous and kept this reviewer on the edge of his seat. As a film on its own it elevates the disaster/monster genres. 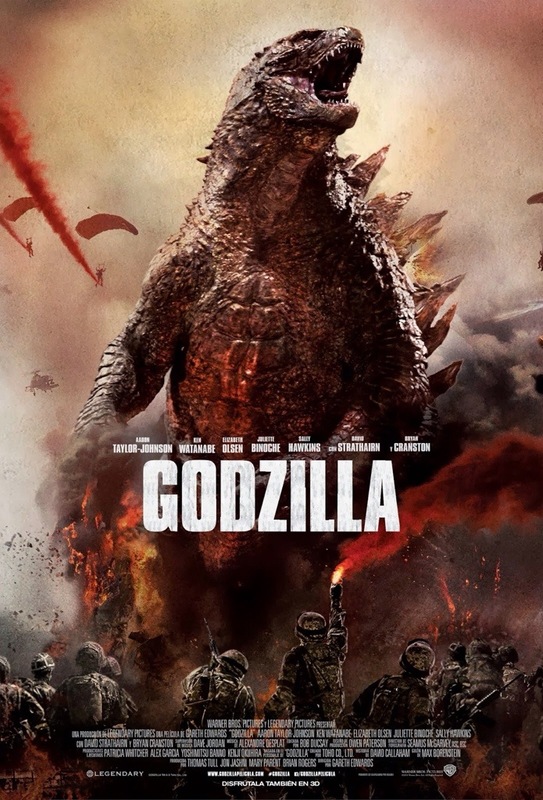 As a Godzilla film however its is best enjoyed as a sequel to the originals and not as a reintroduction to the myth and legend of the king of the monters. This entry was posted in Movies, reviews and tagged Battles, Godzilla, Monsters, movies, reviews, Toho. Bookmark the permalink. ← Amazing Spider-man 2 or How I learned to stop caring and love the grit.